China regards Belarus as a promising market for its armaments. Attempts to establish cooperation between NATO and CSTO have failed. The situation in Afghanistan keeps special services and border guards from CIS countries on their toes: an escalation of the conflict is expected in the spring. Several ex-Soviet countries are getting ready to repel attacks from the Taliban. Belarus plans to start manufacturing engines for cruise missiles with the support of Ukrainian experts in 2016. Belarus' Ministry of Interior has a hard time recruiting new staff. All of this and more in this edition of the Belarus Security Digest. 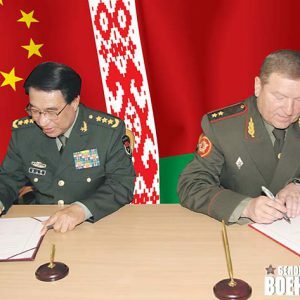 On 8 November, the defence ministries of Belarus and China signed a protocol for a bilateral agreement on non-repayable military assistance provided by China to Belarus. It is highly likely that it will be another batch of armoured vehicles. Conversely, it is unlikely that the amount of aid will exceed $7m as Beijing pushes its military wares on international markets. The gifting of these goods is really a sales promotion, which allows potential buyers to familiarise themselves with the quality and technical features of the Chinese products. Belarusian soldiers are already became familiar with Chinese small arms back after a November 2012 a joint anti-terrorist training session known as "Swift Eagle – 2012" took place in China. The Collective Security Treaty Organisation (CSTO) decided to suspend efforts directed at establishing relations with NATO. They have motivated this decision by their non-constructive, and often openly hostile, position held by the EU and the Alliance. The CSTO regularly accuses NATO of attempts to destabilise the situation in CSTO countries. They cite the alleged "disproportionate increase in the number of employees of Western embassies and, first of all, the United States" as well as "revitalisation of numerous NGOs funded through Western grants" as being reasons for concern. The CSTO's renunciation of contacts with NATO was expected: CSTO has attempted to establish dialogue with their western colleagues since 2004. The West ignored them and favoured the development of bilateral relations with CSTO's member states. In fact, this decision, even if it does not affect anything directly, is one of the hallmarks of the "Cold War 2.0" between Russia and the West. The lack of recognition by the West signals the limited international importance of CSTO. The situation in Afghanistan has been at the centre of attention of the CIS' special security services and border guards. On 5 November, a meeting of the Council of Heads of Security and Special Services of the CIS member states took place in Minsk. The agenda included the issues of combating international terrorist organisations operating in Afghanistan because of the threat of an expansion of their activities into the territory of the CIS after the withdrawal of most the ISAF's troops in 2014. Separately, they have discussed measures to protect their transportation infrastructure from terrorist attacks. On 20 November, in Brest, a meeting of the Council of Commanders of Border Troops of the CIS took place. According to experts, the situation on the ground is showing signs of deterioration. In spring 2015, the situation on the border with Afghanistan will become even more difficult. In November, a meeting of representatives of the Ukrainian corporation Motor Sich and the State Military and Industrial Committee of Belarus took place in Zaporizhzha, Ukraine. Both the Ukrainian and Belarusian parties avoided advertising this event officially and have refrained from making any comments on it as well. Meanwhile, information is circulating about some preliminary agreements on expanding cooperation between the two parties. In particular, the manufacturing line for small gas turbine engines for cruise missile may be moved to the JSC Orsha Aircraft Repair Plant. Belarus has never manufactured anything similar; it lacks the expertise, an engineering school and even the manufacturing equipment. If the agreement were implemented, it would become a serious technological breakthrough for Belarus. Even despite the fact that the Ukrainian experts be the ones to make it happen. Manufacturing is preliminarily scheduled to begin in 2016. On 25 November, Minister of Defence Jury Zhadobin was discharged from his post as a result of aging out. The forty-seven-year-old Andrej Raukou was appointed to take over his post. This move can be viewed as one technical manager of the military agency being replaced by another. This staffing decision was taken in the framework of Lukashenka's recent policy to bring in younger senior managers to important posts in the government. The new minister has already made it clear that no major changes should be expected in the defence field as Alexander Lukashenka has defined the strategy. He will simply have to implement it. Traditionally, the details of this strategy are not disclosed. The indicator of the defence budget for 2015 will be of critical importance. It will be a sign of a possible shift in government priorities in connection with the ongoing regional security crisis. The Ministry of Interior is undertaking efforts to improve the situation with the nation's police force staffing. They view the professional orientation of youth as one of the potential tools to rectify the situation. In November, the Academy of the Ministry of Interior held a seminar with managers of the nation's school system, which has introduced legal education classes as well as the cadet schools with the participation of Major General Ihar Shunievich, the Interior Minister. This confirms the importance of this policy shift in the activities of the ministry. The lack of budgetary funds limits the ministry's ability to overcome the more negative trends associated with new personnel recruitment. Discussions about the bloated budgets of security agencies in Belarus is nothing but speculation. A year ago, the Office of the Prosecutor General of Belarus demanded that the Department of Internal Affairs of the Minsk region to fully staff the economic crime units with qualified experts. Police Colonel Siarhiej Bandaryk, head of the Main Department of Ideological Work of the Ministry of Interior recognised then the existence of serious problems with the recruitment of high quality personnel. Three main reasons explain it: recruits poor health; tough competition on the labour market; and new recruits' mind-set that views financial well-being "here and now" and an issue associated with their prospective careers' progression. Last Wednesday, Russia's ambassador to Minsk announced that Belarusian enterprises provide 15% of Russia's national defence purchases (oboronzakaz). This figure may grow —​ Moscow promised to transfer the orders it had with Ukrainian firms to Belarusians. Yet Russia is also demanding from Minsk that it sells Belarus's defence factories to it. Minsk is doing its best to resist: it develops new products, extends defence exports outside Russia and constantly seeks other partners in post-Soviet and developing countries. The Belarusian government is trying to attract Ukrainian specialists, expertise and technology which can help it in this undertaking. The development of the national defence industry illustrates how the Belarusian government is seeking to maintain a balance between the huge sums of money coming in from Russia and the need to find alternative markets and opportunities. Belarus produces few self-sufficient military items — its national defence industries for years focused on air defence equipment, optics, electronics, command and control systems, electronic warfare items. Most of Belarus-made military equipment are destined to be installed on Russian or Ukrainian machines (tanks, aircraft, etc.). Due to close military cooperation with Russia, Belarusian firms supply Russian products with these sophisticated and expensive kinds of equipment. It explains how Belarus managed to secure for itself such a large share of Russia's military purchases ($7-7.5bn). Belarusian enterprises also participate in Russian arms exports. Little information was published on it, yet out of $950m Russo-Indian tanks deal in late 2000s $90m went to Belarusian Beltekhekspart and Israelis which supplied electronics. Problems have emerged in Russo-Belarusian ties as a result of another priority of the Belarusian defence industries: the overhaul and modernisation of aircraft, helicopters and armoured vehicles, air defence systems, radars, electronic intelligence and warfare. Even Russian military experts frequently admit: Belarusian firms do it cheaper, and better than their Russian counterparts. As a result, Russian state corporations frequently make orders to Belarusian enterprises instead of giving them to their own underemployed plants and factories, as one anonymous expert from the Moscow-based Centre for Analysis of Strategies and Technologies close to the Russian military complains. The Kremlin recently started to alter its cooperation with Belarusian defence industry by demanding that Minsk basically give them away to Russian owners working in the same field — owners who are interested in shutting down Belarus-based production lines in order to get rid of competitors. In March 2013 Moscow forced Minsk into an agreement to sell controlling block of shares of the Minsk-based MZKT works which supplies Russian missile forces with chassis. So far Belarus managed to delay it knowing that if Russian KAMAZ buys the Minsk works it will not last for long. To survive in its unequal relationship with Russia, Belarus has to look for markets and opportunities outside of Russia. Although Lukashenka said that national defence industry would create new product lines in cooperation with Russia, such as aircraft, Moscow's attitude towards Belarus's needs have more than once disappointed Minsk. Defence issues fit into this paradigm as well. Russia has avoided giving Belarus many newest weapons. Lukashenka himself recently complained that "the others, alas, not Russians, are helping us." Undoubtedly, one of the these unspecified 'helpers' is Ukraine. Belarusian military industrial firms for years have cooperated with their Ukrainian counterparts. They successfully created new joint products such as anti-tank weapons and air defence systems sold mostly to post-Soviet Azerbaijan, Kazakhstan and Turkmenistan. In cooperation with Motor Sich, the world-reknown Ukrainian manufacturer of aircraft and helicopter engines, Belarusians were able to establish a joint venture for the complete overhaul and future production of its Mil helicopters (first and foremost, the Mi-8 model) in Orsha. Moscow does not like the Orsha project as it is in direct competition with Russian firms. In October, a Jane's Defence Industry publication even claimed that “Belarus threatens to terminate the Motor Sich share holding in Orsha aircraft plant.” This news, however, resembles a rumour disseminated to disrupt Belarus-Ukrainian relation. Other reports following the October visit of Motor Sich delegation to Belarus spoke only of ordinary problems with delays in the implementation of previous agreements with the Ukrainian firm. Minsk obviously tried to put pressure on Motor Sich to proceed more quickly with its plans in Belarus. In September, the Belarusian president demanded from the industry to create a closed cycle of production for some national defence products. To produce them without serious dependence on imports, Minsk can attract specialists, technologies and capital from the war-torn Eastern Ukraine. In April, visiting the Baranavichy 558th Aviation Repairs Works, Lukashenka stated: "Let's try to make deals with the Ukrainians and work together so that Ukraine's intellectual and engineering centres and designers do not perish. Now is the right moment… we shall use this moment not only for ourselves but for external markets as well". Meeting with the Motor Sich managers in October, he declared his willingness “to accept all Ukrainians who want to live and work in Belarus.” The Belarusian leader asked his Ukrainian visitors, “you should work with Russia through Belarus. I do not conceal it, it is the right way”. Given Russia's dependence on many Ukrainian components and even complete defence or dual use products (like aviation engines), Minsk has some good chances to make this a reality. According to military expert Alyaksandr Alesin in late September, a delegation from the Belarusian military industrial complex headed to Ukrainian military enterprises. They paid particular interest in factories and design organisations in Kyiv, Lviv, Dnipropetrovsk and Chernyhiv which dealt with missiles and missile components (i.e. air defence, surface-to-surface and cruise missiles). Insiders from the Belarusian defence industry confirm that some Ukrainians already have arrived. Ukrainians can offer significant help with air defence items which remain to this day the main speciality of Belarusian defence industry. Belarus currently modernises Soviet-era surface-to-air missile (SAM) systems and effectively develops new types of them for several post-Soviet and developing countries. Some of these products already involve no foreign cooperation and contain no foreign components with one very significant exception – missiles. Until now, Belarus produced no lethal equipment. 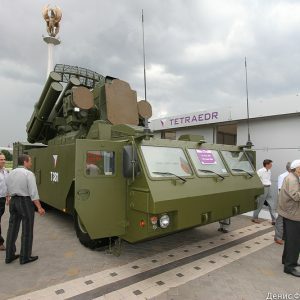 Recently, Belspetszneshtekhnika hinted at plans to produce missiles for SAM systems in Belarus. They will have to deal with any number of technical difficulties to realise their plans, however Alesin believes that the decision to launch missile production may have been taken at the highest levels of government some time ago. And it is precisely the Ukrainian experts who will be able to establish their production. The centre of Soviet missile development and production has always been in Eastern Ukraine. The Belarusian defence industries emerged during the Soviet times as a part of a larger Soviet military industrial complex. They had few chances to survive on their own, yet they managed to find new markets and now may even find a means to expand. In its military industrial policies, Minsk is careful to not antagonise Moscow too much, yet it also defends its interests against the Kremlin's pressure (the Motor Sich project is a case in point). Belarus is using its proximity to Russia to its advantage, while actively looking for other opportunities as well. In the period of October-December alone, Belarus has held talks on military technical cooperation with China, Vietnam, Turkmenistan, Angola and Pakistan. National defence industries can contribute to the consolidation of a viable independent state.